U of T architecture professor Benjamin Dillenburger has created the first entirely 3D printed room to demonstrate the disruptive potential of the new technology for architecture. It’s a room that could not have existed just a few short years ago. Entitled “Digital Grotesque,” the space is somewhat of a cross between Baroque design and alien spacecraft interior, boasting fantastic, undulating shapes and ornamentation so intricate that it almost seems like something alive has turned to stone. According to Dillenburger, one of the most exciting benefits of state-of-the-art 3D printing technology is that it allows us to embrace once more the painstaking architectural detail of centuries past, even in this age of efficiency and mass production. “With digital fabrication technology, we can again design very intricate details and complex architectures and materialize them,” says Dillenburger. To create the room, Dillenburger and co-creator Michael Hansmeyer used a huge 3D printer to fabricate 64 massive sandstone parts. Each part is made of sand infused with resin that is then built up layer upon layer at a thickness of only 0.13 millimeters, allowing for an incredibly fine level of detail. The 11-ton room with its 10-foot walls took a month to print but only a day to assemble. The strangeness of its design can be explained in part by the fact that it wasn’t conceived by a human being but by a computer executing algorithms. Creating the room with sandstone in the traditional manner would have been prohibitively difficult. “A mill head is like a drill, so it can’t reach all these elements. You would have to break the room up into a thousand pieces in order to access all the tight spaces. That’s too much work and not all that practical,” says Dillenburger. With 3D printing, he explains, such constraints fall away. There is no difference in terms of effort, speed or cost between producing a simple square block and creating the most wildly ornate shape imaginable. 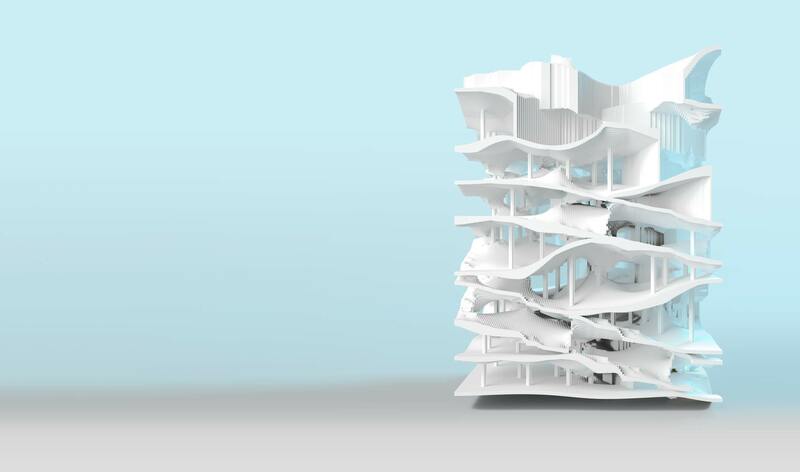 “Using computational design and digital fabrication, even the most lavish and complex architecture can now be materialized with relative ease,” he says. “This makes it possible to combine the precision and efficiency of prefabrication with the variability and flexibility of digital technology.” One implication is that we may all one day live in entirely customized homes that reflect our tastes—instead of hanging art on the walls, the walls themselves can become art. Another element that becomes flexible is dimensionality—this is 3D printing after all. “It can be ornamental and functional at the same time. For example, you can adapt the wall thickness or create perforations. You could even include a certain climatic performance,” says Dillenburger. He explains that elements can be printed with hollow structure for air ventilation, water circulation and to boost thermal insulation. Architects can also make areas thicker or thinner depending on the force loads a section needs to carry, allowing for efficient use of materials. The new techniques are not restricted to manufactured sandstone. Other possible materials include steel, plastic, glass, and concrete, with some printers capable of mixing materials to combine attributes such as hard, soft, transparent or opaque. Using a method analogous to 3D printing, Dillenburger and Hansmeyer even created an installation made out of wood panels for a competition for which they were finalists at New York’s Museum of Modern Art. How do we switch off cancer?